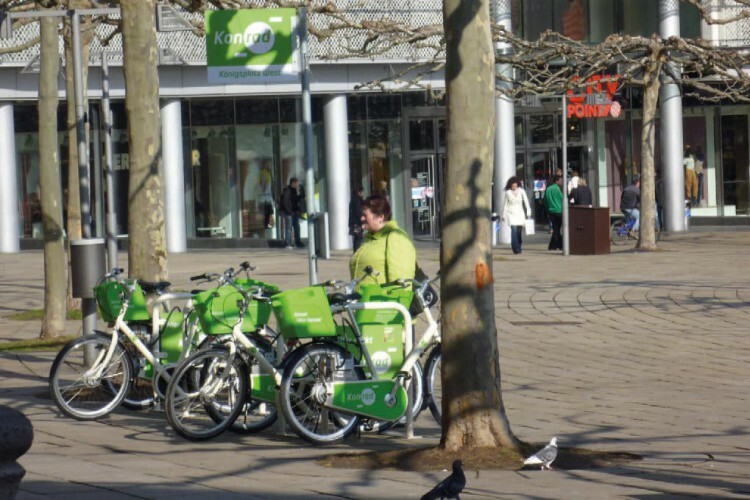 500 Bikes for a rental bike system in the city of Kassel in collaboration with DB Rent. This rental bike was also based on the patented „Paper Bicycle“ – equipped with various adapters to fit public cycling requirements. The unisex frame with an easy stepover and an integrated chain-box carries 26“ wheels for a comfortable ride. The seemless adjustable and low-maintenance NuVinci internal gear hub and Shimano Rollerbrakes ensure everyday operations. The hub dynamo and the sensor-controlled LED lights make the bike visuable at all times. DB Rent uses a special bike lock that contains an electronic chip. The bikes are not locked in stations and can therefore be put back to special assigned areas all around the city. These areas also have a sensor that communicates with the bikes.